Whether you're traveling to a corporate event, shuttling wedding guests, attending a sports tournament, or planning a school field trip, we'll pair you with the perfect bus for your group. Consider your trip distance, number of passengers, and choice of amenities before deciding on your private model. The 25 passenger minibus rental is the perfect size for a wedding shuttle to transport small groups of passengers between their hotels and the venue or reception. Ideal for shuttling several small groups from their parking spots, your guests are ensured to arrive prepped and on-time in this minibus model. A 20 passenger minibus is our most used charter for small groups of students or volunteers due to its adjustable seating arrangements. The reclining seats and internal storage bays allow for optimal luggage space so guests will no longer have to worry about tripping over bags in the aisles! A 56 passenger MCI rental can smoothly transport guests and attendees with plenty of room to stretch and relax with high-class on-board amenities. 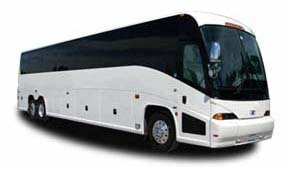 As our largest model, the MCI can shuttle large tour groups to and from far away distances and can streamline them anywhere in the city or surrounding state. When traveling short distances, the 18 passenger minibus is our most popular option. This bus model is well suited for local events and school field trips as it's a safer, more cost-efficient solution to short-distance group travel. The minibus model even comes with the premium features of our full-sized models.